We have all been to a museum with our school or on family trips, but there are hundreds of museums in the United States that give a glimpse into unique and interesting worlds. There is no reason to frequent the typical boring museums when there are so many unique places to learn and have a little fun. Make an effort to visit any of the many museums listed and make yourself a little more cultured and give you and opportunity to add some excitement to your collegiate life. National Museum of Funeral History Death is an interesting issue and the National Museum of Funeral History in Houston, showcases everything you would or would not like to know about funerals. It is the largest museum of this type, with over 35,500 sq. ft. of exhibition space. The NHFH houses a unique exhibit, in partnership with the Vatican, called Celebrating the Lives and Deaths of the Popes. From a detailed explanation of the Mexican Holiday, The Day of the Dead, to historical hearses, this museum could definitely teach you about funerals and the process of commemorating someone’s death. Burlesque Hall of Fame This museum is located in in Las Vegas, a city that is known for glitz and glamour. Featuring the playbills, costumes, and other items used in strip tease routines. If you visit the museum the first Saturday in June you will catch the Miss Exotic World Pageant, which features stars from the burlesque world. The museum documents, from its origin in the early 1900s, the history of American Burlesque and its performers, and is sure to entertain you as any striptease may. Sing Sing Prison Museum The original cellblock, erected in 1825, of the infamous Sing Sing Prison has been converted into a museum. If you have ever been intrigued by prison life this is the museum for you. Sing Sing Prison Museum contains all types of confiscated prison weapons and cells that once housed inmates. There is also an electric chair that has taken the lives of over 600 people on display in the museum. This museum will give you an opportunity to see up close what movies could only imitate. The Museum of Questionable Medical Devices This museum is also known as the “Quackery Hall of Fame.” There is a large array of odd medical devices and home remedies that have been invented to cure ails. Strange procedures and devices that were used on the prostate and devices that were used to enlarge breasts are housed in the museum. None of these gadgets may actually work, but it will surely intrigue you to see the unusual ways people have tried to cure themselves over the years. The Museum of Menstruation and Women’s Health Menstruation is often a sensitive issue that many women do not like to talk about openly, but if you are a free spirit this museum may be for you. Possibly the largest collection of funny and unique ads about “that time of the month” and the evolution of tampons and sanitary napkins can be found at The Museum of Menstruation and Women’s Health, located in Washington, DC. New Orleans Historic Voodoo Museum Voodoo, which originated in Africa, came directly to New Orleans and has a dominant culture in the city. If traveling to the museum with a group, special ritual services can be booked. There is an entertainment aspect, where dances and music from traditional Voodoo rituals are performed. Authentic ritual services can also be requested after you look at artifacts and learn more about Voodoo as a religion and culture. If you happen to be in New Orleans, this museum will be a great way to learn something about the cities historic culture and have a little fun. The Spy Museum The national government has an air of secrecy around it so it is only appropriate that Washington, DC, is the home the Spy Museum. 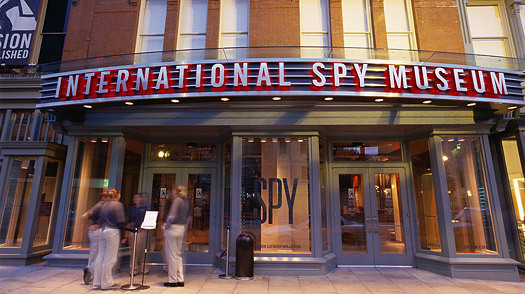 This interactive museum has a variety of exhibits that show you the “real” technologies and missions of spies. Artifacts, photos, and videos from genuine spy missions are on display, and the secret life of spies is revealed. This museum will be a fun and different experience than the other more popular museums in DC, without doubt. Lelia’s Hair Museum During the nineteenth century it was a popular custom to make pieces of art out of human hair. Lelia’s Hair Museum contains a extensive collection of hair wreaths and other pieces of hair art. Lelia, who will likely be your tour guide, will be able to give you a comprehensive history of hair art, which was usually made when someone died or as a reminder of home for soldiers. This museum may be leaning toward the odd side, but you just may learn more than you expect. Trash Museum Connecticut Resources Recovery Authority’s Trash Museum provides a detailed history and tour of trash. Visitors to can watch Hartford’s recycling facility in action and see past methods of trash disposal. There are also pieces of art made from trash removed from the dump on display. Fans of the “green movement” will love this museum, and anyone who is not will surely learn more about conservation. Museum of the Alphabet The Museum of the Alphabet is for your inner geek. This museum documents the history and evolution of alphabets from around the world. Pictures and the origins of these alphabets are described in detail. So, if you are near Charlotte, NC, make an effort to see this interesting and unique museum.